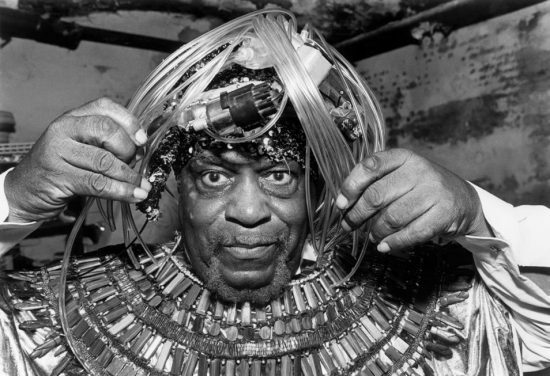 The Sun Ra Music Archive, online home of much of the prolific keyboardist/composer/bandleader/theorist’s album catalog, has just premiered the first three episodes of a new radio series, Sun Ra Radio. The episodes, each approximately three hours long, present an overview of the alleged Saturn native’s career with a combination of studio and live recordings by him and his long-running Arkestra, plus vintage interviews with the man himself and other artists, including Andrew Cyrille, Charles Gayle, Milford Graves, Sunny Murray, Archie Shepp, Bernard Stollman, and the Rev. Frank Wright. Most of the music played on the series is taken from remastered albums on the Saturn and El Saturn labels, which are available in their entirety elsewhere on the website. Further episodes, containing more music and interviews, are scheduled for the future. Check out Sun Ra Radio. We'll definitely check that out! We like to claim Sun Ra here in Birmingham, even if he was from Saturn. A fascinating guy and quite ahead of his time.